S&G consists of 9 different departments, each one connected to the next. We commend ourselves in being a unified team that works together on each and every project we receive. For Customers, that means you can have complete confidence in our ability to manufacture your project and results that will exceed your expectations. The Quality at S&G is what we are known for. We don’t hire hourly workers here; we hire Craftsmen with the drive to create, Salesmen with the love of trade, and an overall working mentality, of all our staff, to achieve Greatness. Beginning in 1994 as a metal fabricator, we opened our metal shop in Hilliard, Ohio with a 20,000 sq. ft. facility. In 1996 we doubled our facility to welcome the growth that was occurring and in 1998 we added an additional 40,000 sq. ft. to accommodate wood manufacturing into our business. Just one year later, in 1999, we added another 40,000 sq. ft. to increase our metal and wood manufacturing, totaling our facility to 120,000 sq. ft. In 2008 we purchased a 240,000 sq. ft. facility in Logan Ohio, to give us the ability to stage up to 30 stores at a time and in the same year we also added SolidWorks, one of the best brands in designing software, to our business.From humble beginnings to an extraordinary corporation, today S&G continues to grow and we are fully dedicated to making sure our Quality, Professionalism, Resourcefulness, and overall Product is what the Customer wants and needs for their business. With more than 20 years of experience and devoted work at S&G, Sales Representatives, Engineers, Fabricators, Purchasing Consultants, and Customer Service Representatives are true Professionals. The experience our employees have under their belts only adds to our success in delivering the best product, in the fastest time. 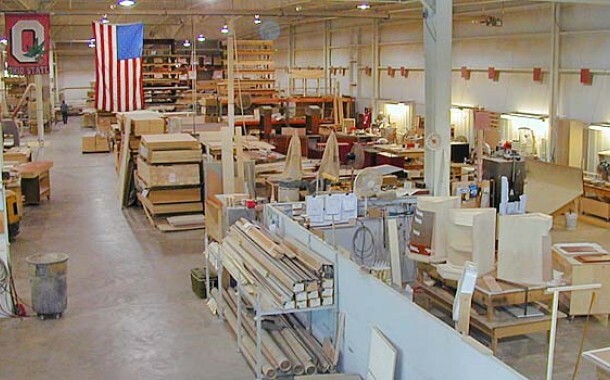 S&G Millwork department in Hilliard.